Among the scores of Porsche sports cars arrayed before you at Luftgekuhlt 5, you may notice a silver single-seater sitting on old school, open-center, five-bolt Porsche wheels. 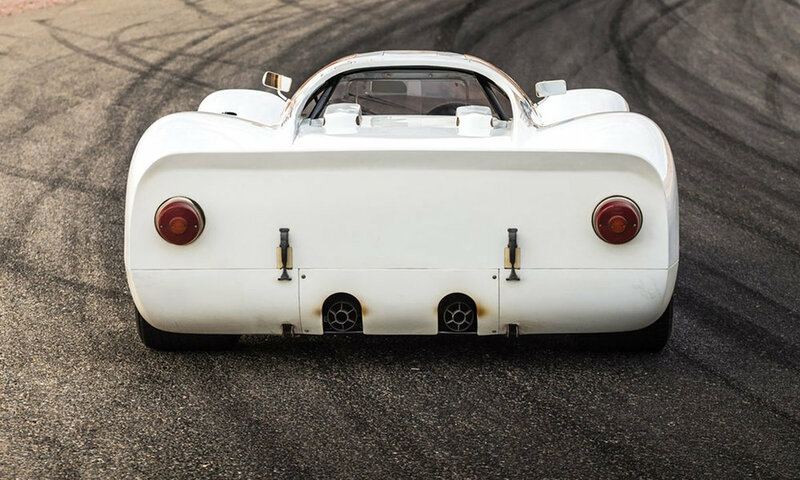 If your memory doesn’t extend back 56 years, you might wonder if this spindly car is some kind of Super-Vee, but we can assure you it’s a proper Porsche Formula 1 car – and a Grand Prix winner. This car is the Porsche 804 chassis 03, driven by Southern Californian Dan Gurney to victory before a crowd of more than 300,000 at Porsche’s “home” race, the Solitude-Rennen, held on July 15, 1962. By the mid-1950s, Porsche was building its first dedicated racing car: the 550 Spyder utilizing the Ernst Fuhrmann-designed four-cam engine. This progressed to the 1958 Porsche 718 RSK Spyder, which was cleverly engineered so its steering wheel could be moved to the center of the car, allowing owners to contest 1.5-liter Formula 2 races. In 1959, a small group of mechanics developed a true, open-wheel version of the 718 Spyder. Known as the 718/2 it won Porsche the F2 title in 1960. In 1961, Formula 1 downsized to 1.5-liter engines, and so Porsche decided to race a development of the 547/3 four-cylinder, boxer-engined cars against the V6 Ferrari and Climax-powered Lotus. Dan Gurney, who entered Grand Prix racing with Ferrari in 1959, would drive a works Porsche 718/2 to a third place tie with Stirling Moss in the 1961 World Drivers’ Championship. Ferry Porsche let it be known that an eight-cylinder Formula 1 engine was being developed for 1962, and 30 year-old engineer Hans Metzger was assigned to the project. Metzger executed Porsche’s design specifications for a 1.5-liter air-cooled flat-8, which could also be developed for sports car racing. The type 753 engine was incredibly complex, but its dual-purpose design meant it was also superbly robust. Like the Fuhrmann motor, it had gear-driven camshafts, and the flat-8 eventually produced a competitive 185hp. An all-new tubular steel chassis was developed for the type 804. It had proper double-wishbone suspension working in concert with Porsche’s familiar torsion bars and a six-speed transmission. A sleek aluminum body gave the car a more elegant appearance. Gurney showed the 804’s potential in the season-opener at Zandvoort and lobbied Ferry to race the car at Monte Carlo. Gurney was third fastest qualifier, but failed to complete a racing lap when Willy Mairesse lost control after jumping Clark and Hill at the start. The 804 was rammed by Richie Ginther in the ensuing chaos and was out of the race. Following Monaco, Dan went to work with Metzger and chassis man Helmuth Bott to develop the 804 into a car that could beat the Nürburgring lap record. They then took it to the French Grand Prix at Rouen, and while the rough French circuit broke the faster BRM P57 as well as the monocoque Lotus 25 of Graham Hill and Jim Clark, Gurney would deliver Porsche’s first Grand Prix win. The next event on the schedule was Porsche’s home race, the Solitude-Rennen, held at the sinuous and challenging Solitude circuit in the forested hills above Stuttgart. Because the Nürburgring hosted the official German Grand Prix, Solitude was not a points-scoring contest. Nevertheless, a strong field included Team Lotus, led by Jim Clark and Trevor Taylor. 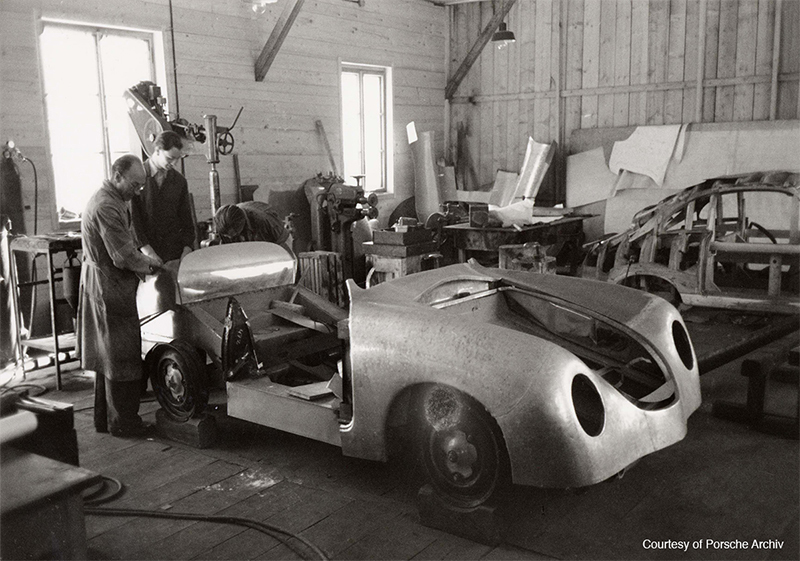 Porsche constructed a brand new car for Gurney — chassis 804-03 – the same car displayed at Luftgekühlt 5. 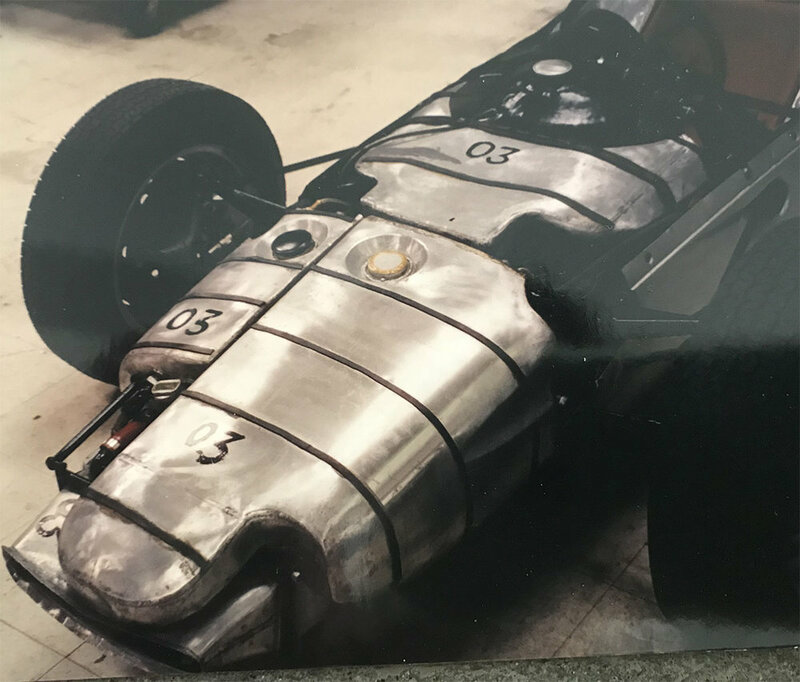 When the car’s current curator showed details of 804-03 to Dan nearly 40 years later, Gurney immediately recognized the scalloped fuel tank that Bott had specifically designed so the tall Californian could recline deeper into “his” car. Clark nipped Gurney by nine tenths to put his Lotus 25-Climax V8 on pole and led during the first lap, but Gurney wasn’t going to let the home crowd down. He passed Clark by the second go-round. The two drivers broke away from the rest of the field, as the Scotsman slipstreamed Gurney’s 804-03. But Jimmy couldn’t pass the Californian when rain began to fall on parts of the circuit. On lap 19, Clark failed spectacularly in his attempt to catch Gurney, skidding helplessly into the haybales. The green Lotus limped to the pits with smoke pouring out the back and was retired. Gurney proceeded to lap the field, excepting his Porsche team-mate Jo Bonnier and Clark’s team-mate Trevor Taylor. Dan’s emphatic victory at Solitude wasn’t his only highlight in 804-03. 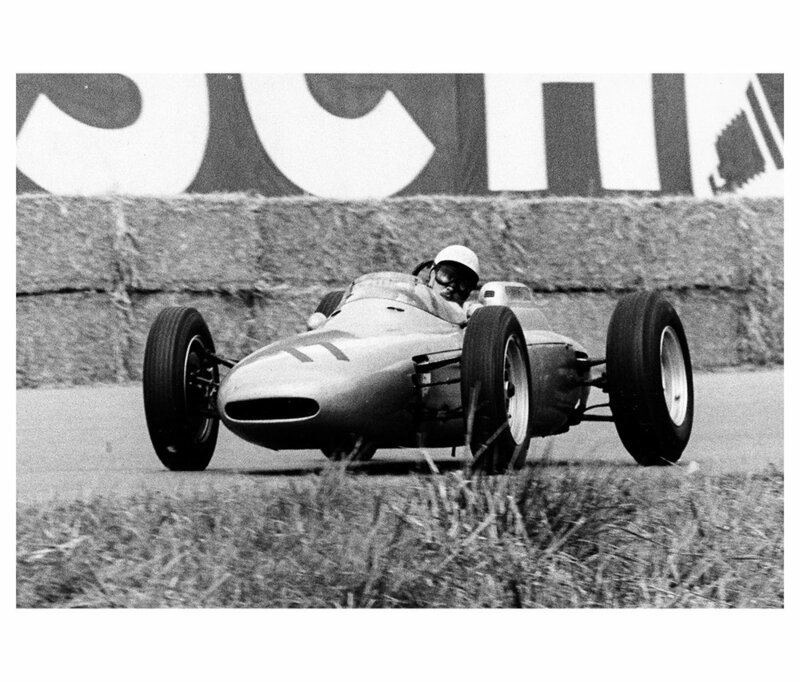 On August 5, 1962, he started the car from pole position at the German Grand Prix at the Nürburgring. It was what he later told 804-03’s curator may have been his greatest Porsche Formula 1 drive. In typically terrible Eifel weather, Gurney led the first two laps until Graham Hill was able to force his way past in the BRM. A furious three-way nose-to-tail dice began between Gurney, Hill and John Surtees. Gurney was handicapped for the final ten laps: his battery had come loose and he was holding it in place with his left leg! The three cars crossed the line covered by a mere 4.4 seconds, with the Californian settling for a hard-fought third place. At the end of 1962, Ferry Porsche made the reluctant decision to withdraw from Formula 1 because it was too expensive for his small company. Engineering resources were needed for the new type 901 — the car we know today as the Porsche 911. The F1 cars were put away, and you see 804-03 today exactly as it was raced by Dan Gurney. However, Metzger’s flat-8 grand prix engine would go on to larger displacements of 2.0 and 2.2-liters, notching up victories at the 1963 Targa Florio in the 718 GTR coupe, and at the 1968 Targa Florio, Daytona 24 Hours (1-2-3), and Sebring 12 Hours (1-2) powering the Porsche 907. April 13 would have been Dan’s 87th birthday, and we wish he could have been with us at Luftgekühlt 5 with his beloved 804-03. The year 1993 would prove to be a pivotal year in motorsport in general and Porsche specifically. With the decline of the prototype classes, and GT development having been virtually forgotten, most competitors had few racing options. But Porsche would emerge that year with an affordable, competitive racecar based on its production 911 model. While sporting options had been available almost since the introduction of the first 911, it was 1973 when a fully realized racing version arrived in the form of the 2.8 Carrera RSR, which was followed by the 1974 3.0 Carrera RSR. Success was immediate and the RSR remained a competitive choice in various series for many years. In the 20 years that elapsed after the first RSR, the engineers at Weissach-Flacht returned to the original concept of what makes a great GT racecar and introduced the 964-based Carrera 3.8 RSR. Inevitably, the production run quickly sold out. Much like the 3.0 RS, a low-volume production run of road-legal 911 3.8 RS models was required for the FIA homologation process. Once certified, the Carrera 3.8 RSR debuted in 1993. 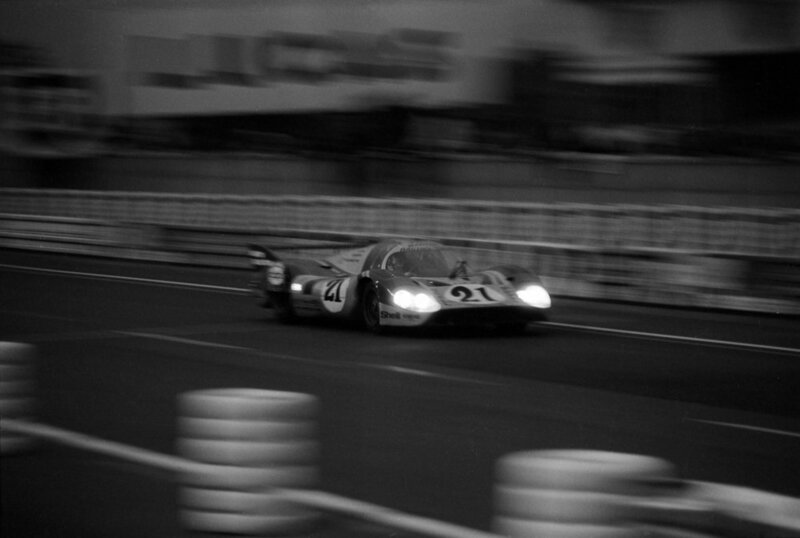 Victories at the 24 Hours of Le Mans and Spa were among the many highlights that year, and the success would continue. Quick! When you think of the first Porsche to win a World Championship, what car pops into your head? A 550 Spyder? 904? Or maybe it is that most famous Porsche race car of all, the 917? Wrong. But don’t fret, it’s a common misconception. While it is a fact Porsche’s first overall win at Le Mans came aboard the 917 in 1970, which also captured a World Championship title that year, it was the often overlooked 908 that brought home the sought after title in 1969. The 911 holds the record for continuous participation in GT racing, but achieving long term results with a prototype racecar is far more difficult task. Yet no prototype went through more evolutionary changes than the 908. It went from its debut in 1968 as a three-liter eight-cylinder coupe, to a six-cylinder turbo Spyder that was winning races in the 1980s. Class is in session for Luftgekühlt 5, with a history lesson featuring one of championship contenders – Porsche 908 chassis 010. One of the rare short-tail coupes. The story of the 908 can be traced back to a structural change within the racing department and the arrival of Ferdinand Piech in late 1964. 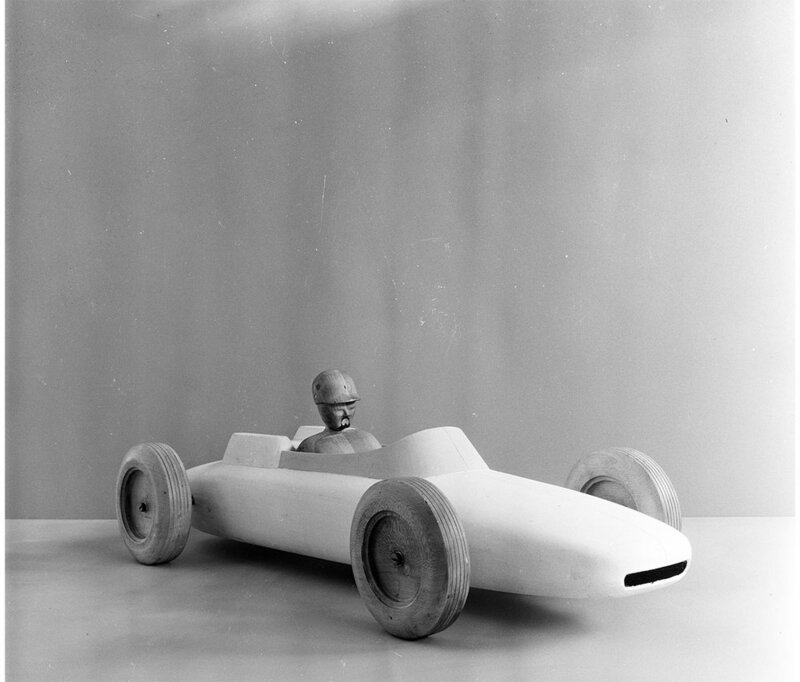 The new mantra was for the design and construction of pure competition prototypes that were no longer considered road vehicles. In rapid succession came the 906, 910 and 907 models, built around a tubular steel frame. The initial 908 run continued this practice until aluminum eventually became the material of choice for every prototype up to the 936. Piech not only wanted lighter cars; he had engineers develop long tails, beginning with the 906, for the best possible aerodynamics. The first 908s were long-tail models, and the advantage was evident on high-speed runs down the Mulsanne straight at Le Mans. The short tail, or Kurzheck models, were considerably lighter in race trim and more adaptable to the majority of the race circuits. Most drivers given the choice preferred the short-tail. Aerodynamic appliances were tested on both configurations as Piech and company experimented to find the optimum set-up. The quest was never-ending and success was measured by ideas that worked and produced results. One area that saw immediate improvement was engine development. The 2.0 and 2.2-liter flat eight-cylinder engines initially began as the 1.5-liter for the Type 804 Formula 1 project. They performed admirably over the years, including a 1-2-3 sweep at Daytona in 1968 in the 907. However, rule changes would require Porsche to develop a 3.0 liter engine. So a new flat-eight emerged from a clean sheet of paper from Hans Mezger and his team. The engineers had a head start on the project thanks to experience with the four-cam six-cylinder effort and, in many ways, the new 908 engine resembled the production motor in the stock 911. The race engine had the usual features such as twin spark plugs per cylinder, dry sump lubrication and Bosch mechanical fuel injection with slide valve throttle bodies. This produced 350hp at 8450rpm. However, there were vibration problems above 7000rpm that plagued the original engine for most of the 1968 season, but the issues were addressed with a new crankshaft and firing order. 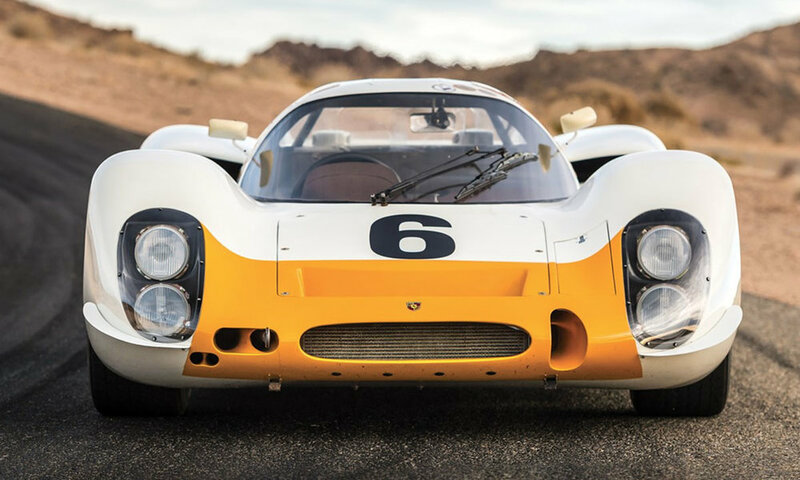 By early 1969, the 908 was ready to challenge the status quo. Using the mixture of long-tail, short-tail and open Spyder bodywork showed the versatility of the 908. The largely overlooked sibling of the all-conquering 917 proved to be the car that reversed the motorsport fortunes for Porsche from underdog to World Champion. The car proudly on display at Luftgekühlt 5 is a rare short-tail werks prototype. Porsche 908 chassis 010 was first raced at Spa in May 1968. The driving team of Vic Elford and Jochen Neerpasch qualified fourth, and Elford fought terrible conditions in the race with pouring rain and low visibility. He led several times during his 32 of the race’s 71 total laps. But just two laps into his stint, Neerpasch slid off the track at Malmedy, eliminating the car from the race. The car was returned to the race shops at Zuffenhausen, dismantled and repaired. The body and chassis remained in storage, eventually purchased by a collector in Switzerland and later sold to an American who oversaw its extensive restoration. It is now displayed by RM Sotheby’s ahead of its auction. As you walk amidst the concentric circles of Porsches at this gathering called Luftgekühlt, we hope that you’re inspired to look for the patterns formed by the passionate stewardship of each air-cooled Porsche spread before you. We anticipate that you’ll be able identify every type and model of the air-cooled Porsche among those on display, but you will begin to notice one model in abundance: the 911. Among those 911’s, we think that you’ll begin to see another theme: personalization and customization. Within that motif, these modifications both large and small emerge as yet another ethos: sports purpose. But this was not so at the birth of the Porsche 911. The 911 was a steel-bodied touring car introduced at a time when Porsche was developing astounding air-cooled racing cars out of fiberglass and aluminum: the 904, the 906, the 907, the 908, and the mighty 917. In many respects, the humble 911 owes its vaunted sports-purpose image to the efforts of one man, a chain-smoking Englishman born in 1935 who now lives in America. His name is Vic Elford. Vic Elford began his motorsport career as a rally driver. He competed in the 1965 Monte Carlo Rally, where factory engineer Peter Falk and test driver Herbert Linge managed to finish fifth overall in a 911 used as a support vehicle for the second-place 904 GTS. Elford made a call to Porsche competition manager Fritz Huschke Baron von Hanstein. Vic met with the Baron and asked if Porsche might be willing to lend him one of their 911’s for the 1966 Tour de Corse Rally. Hanstein protested that Porsche had no plans to rally the 911, but a couple of weeks later he called Elford to inform him that the factory would lend him a car for Corsica with three provisos: no pay; no expense money; and no practice car. Elford and Stone went on to finish a strong third in Corsica, and the Porsche factory agreed to support a single-car race-by-race program that netted Elford and Stone the 1967 European Rally Championship. Porsche also asked Vic to help them out at the Nurburgring, where an 84-hour race called the Marathon de la Route was being held. The 1967 Marathon was a regularity trial contested over a 17.6-mile course encompassing both north and south loops, and Porsche had enlisted Hans Hermann and Jochen Neerpasch to drive a 911R Sportomatic with Elford. In his autobiography, Elford describes being cornered by his co-drivers and told, “OK, Vic, you’re the rally driver, so you drive at night when it’s raining and foggy, and we’ll do the rest!” Thus began four consecutive seven-and-a-half hour nights of driving, after which Vic felt that he knew every blade of grass along the Nurburgring — by name. Despite the deplorable weather that descended on the Eifel Mountains mid-race, Elford’s 911R won convincingly, completing 323 laps and covering 5652 miles. 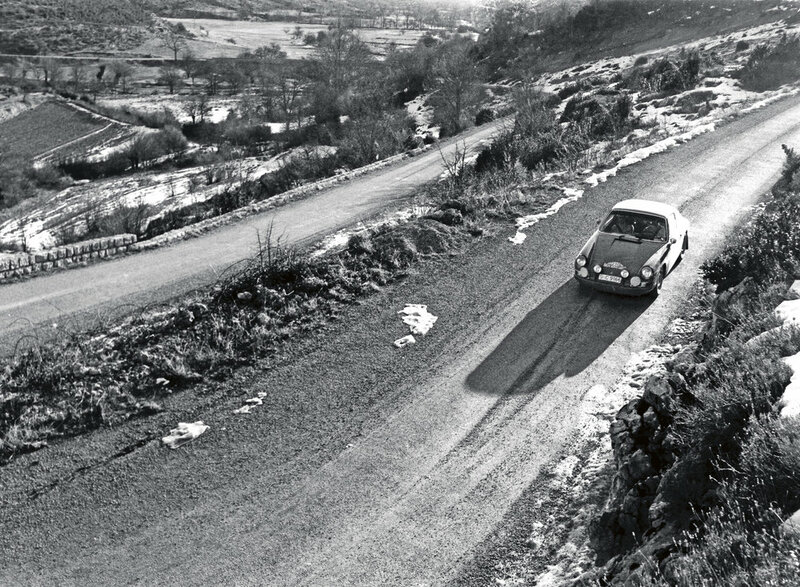 Even greater things came in 1968, when Elford’s red sports purpose 911 delivered Porsche’s first win at the snow-covered Monte Carlo Rally. After the Monaco victory party, Porsche asked Elford to board a plane bound for the Daytona 24 Hours. Vic had never even seen Porsche’s eight cylinder powered 907 langheck — let alone driven one — but he and co-driver Rolf Stommelen won the race. More strong finishes led to what many agree was the greatest Porsche drive of all time, when Elford recovered from not just one, but two flat tires on the opening lap to win the 1968 Targa Florio in a 907 with co-driver Umberto Maglioli. Porsche’s victory poster depicts Elford, not his car — the only time that the car has been left out. Dr. Helmuth Bott said that this was the one time that a victory was solely attributable to the driver, and not to his Porsche! “Quick Vic” went on to be the only driver to race every version of the 12-cylinder 917 long-tail at Le Mans — leading by 50 miles at the 21-hour mark in 1969, taking pole position in 1970, and wheeling the flowing Martini-liveried car in 1971 — although Le Mans was one of the few sports car classics that Elford failed to win. After stints in Formula 1, in Jim Hall’s Can-Am “sucker” car, and with Carlo Chiti’s Alfa Romeo team (narrated by Vic in Michael Keyser’s classic film The Speed Merchants, still available on DVD), Elford became tired of the danger and retired in 1973. However, Vic still serves as a brand ambassador for Porsche, and he recently drove with his wife Anita to Daytona for the celebration of the 50th anniversary of his victory. With Luftgekühlt 5 taking place at the Ganahl Lumber Company South Bay in Torrance, CA, we wanted to share a surprising aspect of Porsche’s history: the connection between lumber and the carmaker’s early history. 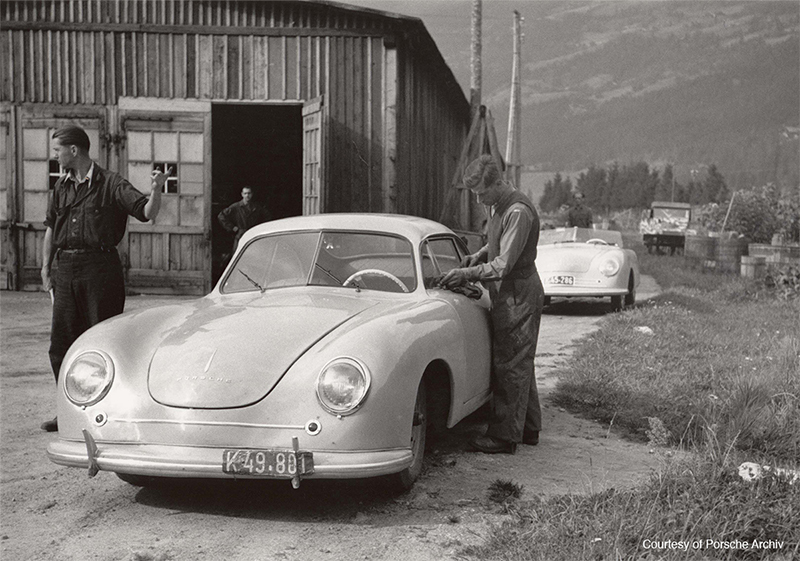 History buffs will be aware that the initial series of aluminum-bodied 356 models were constructed at an old sawmill in Gmünd, Austria, and we wanted to shed light on the story and give context to the recipe used for Luft 5. As most people would expect, the majority of Porsche’s early automotive design efforts took place in Stuttgart, but the beginning of the company we now know actually has its roots in Austria. The move from Zuffenhausen was prompted by allied bombing that had become more frequent in 1943. This prompted the company to relocate to a less active area in 1944. It found a new home in a re-purposed sawmill in Gmünd, a town in the Austrian region of Carinthia. Design work and engineering for both civilian and military projects was carried out here, while a separate facility in Zell em See was used for storage. With the war over, the wooden buildings of the sawmill were soon producing tractor components to help Germany rebuild its infrastructure. 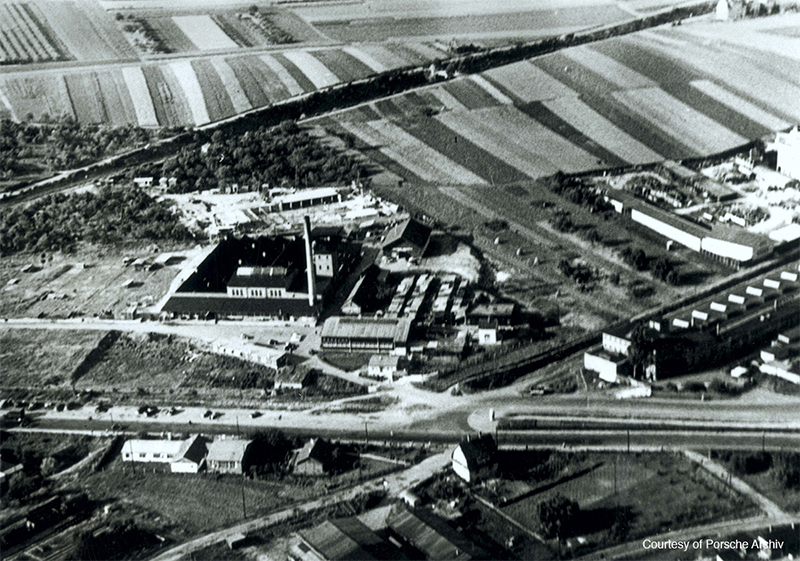 And by the end of 1946, the Gmünd factory employed more than 200 workers. 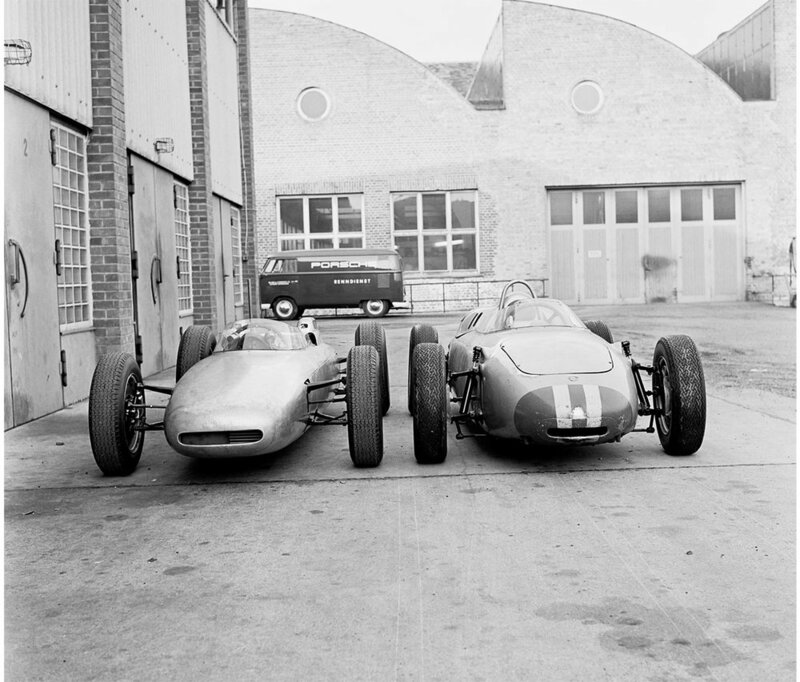 In 1947, Porsche designed the groundbreaking Cisitalia GP in these old wooden buildings. Codenamed Type 360 by Porsche, the 1.5-liter, supercharged, horizontally-opposed, 12-cylinder engine was mid-mounted at a time when grand prix cars favored front engine layouts. It was also designed to be all-wheel drive, which was again unprecedented for the period. As the racecar design was reaching completion in 1947, the design of a mid-engine sportscar was just beginning. Originally intended as a Volkswagen, the first 356 was conceived as a mid-engine, two-seat roadster. Using VW components, the mid-engine design wasn’t ideal because the rear trailing arms had to be repositioned to form leading arms. Even with this handicap, the 356-001 was warmly received by factory test divers and journalists alike. It was at this time, Porsche committed to design and build the car in-house. From the beginning, the rear-engined sportscar was designed in both coupe and cabriolet body types. By April 1948, the first 356/2 sheet metal chassis had been fabricated, and by July the first coupe was completed. Through 1948 and 1949, 53 of the aluminum-bodied 356 were built in the old sawmill, although the exact number of cars remains a point of contention among Porsche fans. By 1949, Porsche finally returned to Zuffenhausen, and although the original Porsche facility was occupied by the US Army, at least they were paying rent. So the small engineering team set up shop in the Porsche family villa. At this time, the company’s prospects were uncertain. Ferry Porsche wasn’t convinced the future lay in car manufacturing. Design and engineering for other companies was more profitable, and there was greater demand for tractors and water turbines in post-war Europe. The 356 had been a success, but it was believed demand would be limited as Europe struggled back to its feet. It was decided that body construction should be subcontracted to one of the many coachbuilders in the area, helping to offset some of the manpower required. Reutter Carosserie-Werke was among the companies asked to bid on the project. The company was built everything from city trolleys to seats, and had previously worked with Porsche on several of the precursors to the Beetle. But while every 356 built in Gmünd was aluminum-bodied, the German-built models would subsequently utilize a formed steel body, reportedly halving the production cost. Reutter also became a landlord in 1950, when Porsche rented a 5000 square-foot production area for the 356. Everything from engine building and suspension construction to final assembly were undertaken here, although engine building and dyno-testing would later move to another building in the Reutter compound. By 1951, Porsche decided to build its own factory. Although the location and design were quickly established within Stuttgart, banks were hesitant to finance the young car company. Help arrived the following year from Max Hoffman, who would later famously bring VW to the USA. He helped Porsche secure a contract to design and build prototypes for Studebaker, and with more than two-million Deutschmarks earned from the project, Porsche finally had its own Stuttgart production facility. For many, a real 911R is a myth and a sighting might be a bit like running into Sasquatch while out on a mountain hike. The few original examples are in museums or hidden away in private collections and other than an occasional turning over to keep the fluids moving, outdoor and public exposure is a rarity. This edition of Luftgekuhlt will have several examples of what many an enthusiast’s tribute and take is on the legendary 911R. Also in attendance will be one of the rarest of the rare, one of the four original prototypes, internally known as R4. Porsche constructed four prototype lightweight specials in 1967, R1 through R4, that were all unique in their own way, offering the engineers under Ferdinand Piech the opportunity to try out a variety of components and materials with the object of reducing as much weight as possible from the standard production 911. Aluminum, fiberglass, plastic and magnesium were all tried and evaluated on the four prototypes with the target of the enforced diet to achieve a weight between 800 to 900 kgs. All four prototypes met their goal and hit the scales over 200 kgs. less than a standard 911. This was accomplished by the use of lightweight fiberglass in the construction of the doors, front and rear bumpers and both deck lids. Steel hinges were replaced by aluminum, Plexiglas took the place of all glass except for a windshield which was half the thickness of the production part. All manner of insulation and undercoating were deleted. The data gathered from the four prototypes were used in forming the basis for the building of twenty identical production models. What really made the 911R stand out from the production 911 of that time was the use of a special engine taken directly from the Carrera 6 or 906. This was a pure racing engine, transformed the experience of driving a 911 dramatically and was to demonstrate the strength of the basic platform, which resulted in eventual increases in displacement and horsepower. The engine that powered the majority of 911R’s were assigned the identification number of 901/22 and carried this stamping on a case of cast aluminum. The internals and carburetion were all taken from the 2.0 liter engine of the 906 with increased intake valve sizes and the use of two spark plugs per cylinder head resulting in a reliable 210 horsepower at 8000 rpm. The five-speed transmission was based on the production 911 but used the limited slip differential from the 906 and a special mainshaft that allowed for a choice of gearset ratios for a variety of uses demanded for hill climbs, rallys and circuit racing. The repositioning of the oil tank was done for more than the reason of easier access but for weight distribution. Cooling was provided with two front oil coolers located behind the headlights of the front fenders. The fuel tank carried a capacity of 100 liters and was made from steel, although units from plastic and aluminum were also evaluated. Very few options were made available for a 911R, the exception being a gas heater manufactured by Wesbasto, as the use of exhaust headers eliminated the standard heating system. The purchase price of a 911R was listed in a press release from December 1967 at 45000 DM or about 12,000.00 U.S. Dollars. Of the four prototypes, R4 is the only one to have survived virtually intact as originally constructed. 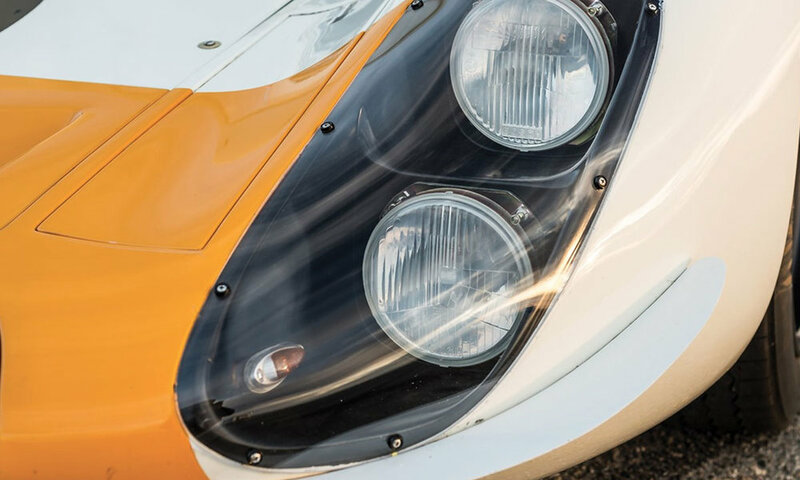 Chassis R1 was heavily raced and modified to the point of being unrecognizable, R2 was in a road accident, disassembled and has been in storage since 1980. R3 was raced, sold, crashed and later rebuilt. The body panels of R4 are original and have not had any modifications, a rarity among most 911R’s. The fiberglass front hood is the original part, easily identifiable by the lack of balsa strips as used on the later 911 race cars. The fiberglass shrouding, fuel pumps, and oil system are fully original as is the steel 100-liter fuel tank. The optional Webasto heater is unique as the few cars that had them installed were usually removed and discarded. When compared to the production models of the twenty cars, R4 remains one of the few intact examples. Due to it’s status as a prototype and one off exterior color, the car stands out from the group of the production 911R’s, as the majority of the production run were delivered in the ivory color known as Hellelfeinbein. When the short life of the original 911R is considered, the influence provided inspiration for every sport 911 that has followed since. Ganahl Lumber Company is the oldest lumberyard in the state California. It all began in 1884, when Austrian immigrant, Christian Ganahl and his brother Frank, moved to Los Angeles from St Louis where they were shopkeepers. Building was flourishing in LA as a result of the large numbers of people moving west thanks in part to the Transcontinental Railroad offering trips to California for $1. Simultaneously, a new industry was developing when Southern California oranges won first prize at the International Exposition in New Orleans, defeating Florida oranges. Los Angeles had a growing population of 22000, and Christian Ganahl seized the opportunity to purchase a lumber business, which he named the C Ganahl Lumber Company. A few years later, Christian made a daring move and opened another lumberyard in the area. Although his "branch yard theory" was a new business idea, it took off and he had several yards throughout the Los Angeles area, including Anaheim in 1904. Up to this point, the C Ganahl Lumber Company sold only lumber and cement. Two years after the Anaheim operation opened, Christian took another risk and added a new product – plywood. In 1921, Christian's nephew, Ernest, bought an interest in the Anaheim yard, partnering with Charles Grimm, the yard's manager. They called it the Ganahl-Grimm Lumber Co and, in 1928, built a second store in Lake Arrowhead. This yard thrived during the depression years because the movie industry was booming and Hollywood movie stars were building summer homes by the lake. Following the death of Mr Grimm in the 1930s, Ernest Ganahl bought out the Grimm family's interest and changed the name to the Ernest Ganahl Lumber Company. He also made his contribution to the changing inventory of the lumber business by adding hardware to Ganahl's growing product line. After World War II, Ernest's son, John, returned home and joined the family business. In the late 1940s there was a growing interest in millwork products, so Ganahl opened a mill division. John became involved in manufacturing cabinets for schools built in the area. Ernest died in 1959 and John became President of the company. In 1964, John changed the name to Ganahl Lumber Company. It was always customary for Ganahl children to work in the family business and John's sons and daughters worked at the lumberyard during summers while they were going to school. John's son, Peter, joined the company full-time in 1968 and became the President of the company in 1973, upon the death of his father. That same year, John Jr and his brother Andrew joined the company. Peter and John have continued their great-grandfather's "branch theory" and have acquired other locations throughout the Orange County area in the last few decades, making the company the ten-store business it is today. Ganahl Lumber Company continues to be a family- and employee-owned business, selling building supplies and hardware to pro contractors and DIY enthusiasts alike. Its products include tools, paint, building materials, millwork, doors and windows. With ten convenient store locations, they serve customers throughout the greater Los Angeles metropolitan area. The latest addition to the Ganahl Lumber Company is the spectacular new South Bay location at 2600 Del Amo Boulevard in Torrance. It was chosen as the location for Luftgekühlt 5 because of the dramatic architecture and backdrops, which provide the perfect setting for the event’s air-cooled Porsches.